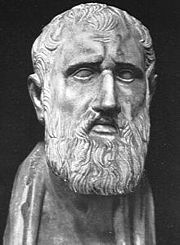 Note: Zeno of Citium should not be confused with Zeno of Elea. Zeno of Citium (The Stoic) (sometime called Zeno Apathea) (333 – 264 B.C.E.) is known as the founder of the Stoic school of Hellenistic philosophy. Born the son of a merchant in Citium, Cyprus, he came to Athens and began to study under Crates of Thebes, the most famous Cynic living at that time in Greece. Zeno studied under several other philosophers, and at the age of 42, began the Stoic school, named for the Stoa Poikile (Painted Porch) where he used to teach. None of Zeno's written works have survived except for fragments quoted in the works of later followers and critics. His teachings were further developed by his second successor, Chrysippus, and the ideas of the Stoics had a significant influence on the Greeks and Romans, early Christianity, and the revival of humanism during the Renaissance. Zeno taught that tranquility can best be reached through indifference to pleasure and pain. He was also a utopian anarchist, arguing that a society of rational men and women had no need of money, courts of law, or organized institutions. Zeno was described as being thin, tall, and of a dark complexion, and lived a frugal, ascetic life. The citizens of Athens showed their respect for him by honoring him with keys to the city, a golden crown, and a statue erected in his honor. King Antigonus of Macedonia often attended his lectures and eventually invited him to be his advisor, but Zeno sent two of his followers in his place. A crater on the moon is named for Zeno. Zeno was born the son of a merchant in 333 B.C.E. in the town of Citium, a Greek colony in Cyprus. Citium had a large Phoenician population and there is evidence that Zeno himself was a Phoenician by birth. Most of the information about him comes from Diogenes Laertius’ Lives of Eminent Philosophers. Zeno became a merchant himself, and apparently, at the age of thirty, he was shipwrecked while transporting purple dye from Phoenicia to Peiraeus. In Athens, he was attracted to the works of some philosophers in a bookshop and just as Crates, the leading Cynic philosopher of the time, was walking by, Zeno asked the shopkeeper where men like these could be found and received the reply, "Follow that man." Zeno became a student of Crates, and later studied under several other philosophers including Stilpon of Megara. Other accounts disregard the story of the shipwreck, and say that Zeno simply sold his cargo and remained in Athens to study philosophy. One of Diogenes’ anecdotes relates how Zeno’s sense of social propriety was challenged by Crates, who asked him to carry a jar of lentil soup in public. When Crates saw Zeno trying to hide the jar from view, he rapped it sharply with his cane and broke it, so that the lentil soup ran down Zeno’s legs. As Zeno ran away in embarrassment, Crates called after him, "Why run away, my little Phoenician? Nothing terrible has befallen you!" Several other anecdotes illustrate that Zeno exhibited the sarcasm and the penchant for shocking behavior common among the Cynics. After a number of years of study under other philosophers, Zeno began to deliver his own discourses walking up and down the Stoa Poikile (Painted Porch). Apparently he did this to restore tranquility to the Stoa, where fourteen hundred people had been murdered during an earlier period of political unrest. Followers began gathering here to listen to his teachings, and were given the name “Stoics.” Zeno did not like crowds and preferred to walk accompanied by just two or three friends. He avoided close contact with his audiences. According to Diogenes, he charged admission to listen to his discourses in order to reduce the number of people in his audience, and also surrounded himself with beggars to discourage those who were not genuinely interested in what he was teaching. Zeno was known for his powers of abstinence and his austere lifestyle; he was very frugal, ate food that did not require cooking, and wore thin clothing. He was very much respected by the citizens of Athens for living according to his own teachings, and for setting an example of temperance and virtue for the young men of the city. He enjoyed drinking wine at dinner parties and when questioned about it, replied that it was better to slip with the feet than with the tongue. Diogenes reports that Zeno did not like to receive public attention and was of an even temperament. King Antigonus of Macedonia, who used to listen to Zeno’s lectures, enjoyed his company and often took him along to social engagements, from which he would quietly slip away. When Zeno was already quite old, King Antigonus invited him to come to Macedonia to advise him. Zeno demurred, saying that he was too feeble, and sent two of his younger followers, Persaeus and Philonides, in his place. Zeno died around 246 B.C.E.. There were varying reports about his age when he died; some said he was ninety-eight but his disciple Persaeus said he was seventy-two. Diogenes reports that he fell as he was leaving his school and broke one of his toes; striking the ground with his hand, he repeated a line out of the Niobe, “I come, why call me so?” and died. Zeno is best known as the originator of the Stoic school of Hellenistic philosophy, which remained popular among the Greeks and Romans for almost four hundred years. He formulated his ideas while studying under several Cynics, including Crates and Stilpon of Megara. Like many other early Greek philosophers, his written works have been lost and his system of thought must be pieced together using the fragments quoted in the writings of later philosophers. His greatest work was the Republic, which described an anarchist utopia that would be governed by reason alone and would have no need of money, courts of law, or temples. Diogenes lists 22 other works by Zeno, on subjects such as the nature of man, the passions, sight, ethics, duty, law, and the doctrines of the Pythagoreans. According to Diogenes, Zeno was the first to distinguish three aspects of reason: logic, natural philosophy (physics), and ethics, with ethics being central. Diogenes also says that Zeno was the first to use the word “duty.” Zeno taught that happiness lay in conquering passions and emotions and conforming to divine will, which governs the universe. In his utopia, men and women would live completely according to reason and therefore would not need laws to govern them or religion to direct their actions. Since the world is imperfect and people do not live according to reason, he taught that it was the duty of a Stoic to live a public life, setting an example and striving to influence others. Zeno declared that men and women were equal, and even suggested that they should dress alike. He received criticism for saying that modesty was unnecessary and that “no part of the body should be completely covered.” He also declared that true friendship could exist only among virtuous people. Virtue was good, everything else was vice and therefore evil. A person could develop virtue by making wise choices based on reason. Zeno was very interested in logic and in the way that an argument could be successfully presented. He frequently spoke out against vanity and ostentatiousness, and valued honesty and directness over carefully crafted speeches. "Steal your sensibilities, so that life shall hurt you as little as possible." "Better to trip with the feet than with the tongue" (said while drunk on wine). Beyan, Edwyn. Stoics and Skeptics. Elibron Classics, 2006. Hunt, Harold Arthur Kinross. A Physical Interpretation of the Universe: the Doctrines of Zeno the Stoic. Carlton, Australia: Melbourne University Press, 1976. Zeno, The Fragments of Zeno and Cleanthes. Edited by A.C. Pearson. New York: Arno Press, 1973. Schofield, M. The Stoic Idea of the City. Cambridge, 1991. Long, A.A., and D.N. Sedley. The Hellenistic Philosophers, 2 vols. Cambridge, 1987. History of "Zeno of Citium"
This page was last modified on 5 July 2013, at 15:33.